Mother Teresa has been declared a SAINT by Pope Francis on Sunday at a canonization ceremony held in Vatican City on 4th September, 2016 on the eve of her 19th death anniversary. She will be now being known as SAINT TERESA of Kolkata. The canonization ceremony began at 2pm IST and was followed by a Eucharistic celebration. People of India who already revere her like a saint will not be too impressed by her canonization. For them, she is already a saint and they do not need to imprimatur of the Church. 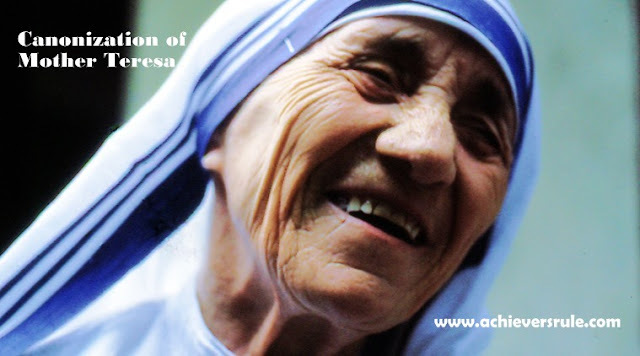 It seems that it is the Church that stands to gain by the canonization of Mother Teresa. The Church gains a sense of legitimacy which it had been losing over the last few decades, especially with the exposure of child abuse by priests of the Church. Mother Teresa was born as Anjezë Gonxhe Bojaxhiu on 26th August, 1910 in Skopje (now capital of the Republic of Macedonia), then part of the Kosovo Vilayet in the Ottoman Empire. She was an Albanian-Indian Roman Catholic nun and missionary. She left home in 1928 at the age of 18 to become a nun to serve the poor and join the Sisters of Loreto at Loreto Abbey in Rathfarnham, Ireland to learn English, with a view of becoming a missionary. When she arrived in India in 1929, she was dispatched to the Loreto Novitiate, Darjeeling, where she began her life as a novice. On 24th May, 1931 she took her first religious vows as a nun. She took her solemn vows on 14th May, 1937. She received Vatican permission to start the diocesan congregation that would become the Missionary of Charity on 7th October, 1950. Mother Teresa died on 5th September, 1997 at the age of 87 in Calcutta, West Bengal. Pope John Pull II beatified Mother Teresa of Calcutta. Pope Francis praised Mother Teresa as the merciful saint who defended the lives of the unborn, sick and abandoned and who shamed world leader for the “Crimes of poverty they themselves created”. A 12 member central delegation led by External Affairs Minister Sushma Swaraj and to State Government-level delegation from Delhi and West Bengal, led by Chief Minister Arvind Kejriwal and Mamata Banerjee were in Vatican City to attend the ceremony.